But that is no excuse for the attacks by those who think he doesn’t have a right to run and put himself through the rigors of a primary to test that concept. From Day 1, I leaned toward Ted Cruz. I know him. I like him. I trust him. 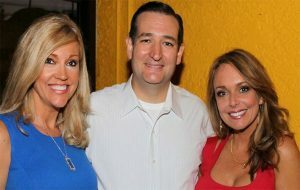 My husband and both of my co-authors and closest business partners, Ann Marie Murrell and Morgan Brittany, have endorsed Cruz. So far, I am holding my fire and trying to be patient as I watch the primary process unfold, and I listen. Cruz, like Trump, has made some decisions that really tested my confidence in him, like attacking my friend, who did nothing except accept a job as spokesperson for Donald Trump. He could have also disavowed those who would subvert the primary process, and he hasn’t. But I am watching, constantly reminding myself that this is the whole point of the primary process – to watch and weed as some amazing candidates put themselves out there to be raked over the coals for the grand prize of facing off against a reckless statist in the end. 1) Trump singlehandedly took on the establishment and won, as no candidate, or grass roots organization has done, to date. 2) Trump singlehandedly put illegal immigration back into the political vernacular after the statists had systematically made the topic unspeakable. 2) admit to themselves that Reagan wasn’t perfect either, and many self-appointed “conservatives” were radically opposed to him in the primary because they didn’t trust his Christian street cred, or his knowledge of policy and the U.S. Constitution. It then becomes more about those who would subvert our primary process in an attempt to undermine the decision process of We the People. How could someone who claims to understand the Constitution and the primary process decide their opinion is so important and yours isn’t? Why is it OK to sabotage the entire primary process by eliminating candidates so many have picked? Previous ArticleDid National Review Break The Law with their Anti-Trump piece?